A blog written by an insane ice cream lady that's updated almost never with recipes, crafts, and attempted general hilarity. Seriously. It's been years. But you know I'm at least feeling really, really guilty about it. You don't need doors if you don't want to go inside. This is what happens when contractors go to brunch. The good news is that it's a gingerbread house so no one is taking me to the People's Court any time soon for a faulty retaining wall. If my close friends and family are wondering why that wasn't a Judge Judy reference it's because she's way more into the "your kid ruined my stuff/you keyed my car/your dog bit me" cases. Millie has the lock on broken contracts/broken relationships market. I know. My DVR is tight. But we are getting off topic. Probably in an attempt to distract you from the Christmas atrocity I created in the name of crafting. Arguably I could have done it before the Bloody Mary but I had already built the kit and let the house set the day before. The decorating was the easy part. THE EASY PART. Unless you deviate from the kit after googling beautiful gingerbread cabins and think......."Psshhh......I got this. Martha Stewart is going to be so impressed she's going to buy me a copper pot for Christmas." I warned you Bloody Marys were involved. a gingerbread house kit- Bonus points for a natural themed one with MARSHMALLOW DEER. Points deducted if you chose the one with little Tootsie Rolls....or as I call them..."Lies of Chocolate." pretzels- Sticks not rods. We are building a fence not a gated estate. But if you do......do not forget the Marzipan pool house. extra icing- I did not have this. So I made it using powdered sugar and water. You'll see how that turned out. HINT: Not well. Not well at all. cinnamon sticks- Normally pricey but if you go to the Yule Tide Depot like me you can find them in the perfect length....5 for $1. Best for building instead of eating as they came in THE most generic pack of all time. coconut flakes- another total score for $1 a bag. Probably because the expiration date is in a month but again....it's purely aesthetically, and not digestively pleasing. Like salmon. Oh man. Sick burn on salmon, there. fake plastic trees- The tiny ones from train sets, not Radiohead albums. horseradish- It's not a Bloody Mary without it. GET COMFY. THIS IS A 2 DAYER. So the kit is pretty great. It had a foundation tray with grooves that I could put the mortar icing and walls in. The normal 3 coffee cup system I had previously developed was no es necessitio. Which is great because you always had to abandon the inside mug for the life of the house after you put the roof on. Like a little gingerbread prison. Which is obviously next year's craft. Assemble your house and let it set overnight to ensure that it will be all loading bearing and stuff. Otherwise you'll need to make a tiny fondant CONDEMNED SIGN.......and right before Christmas! Don't ruin the poor gingerbread people's Christmas. Now it's time for the sides. Since we just noticed that the short sides will require us to trim our cinnamon sticks, let's start with the long sides. Here's where the homemade icing debacle of 2015 occurred. If you don't want to spend ten minutes holding cinnamon sticks onto a gingerbread house while simultaneously trying to not adhere to it I highly recommend purchasing some extra icing. See you in ten minutes. Okay. Not ideal. But we are in this now. It's too late to hire a tiny gingerbread lumberjack so we will have to trim this ourselves. Grab a serrated knife........oh jeez that was close. Don't do that. Okay....Okay.....grab the big knife. Ye ol' Spaghetti Squash Decimator. Use it to cut the cinnamon sticks. One big thwack at a time. Measuring? Measuring is for the nearsighted. Forget that. Plus we can use all the cinnamon shrapnel to as beautiful wooden shingles up in the eves. This is about to be the prettiest lodge ever! No. No it's not. It is nothing more than a waterfall of loose icing and cinnamon shards. We should craft a ginger Sisyphus to keep putting the stupid logs back on the sides of the house. The icing is oozing everywhere. It does not look like snow. It does look like a bird sanctuary after breakfast. But who cares? A coconut blizzard is about to roll in and cover up the ugly like the winter's snow does to your neighbor's rusty tool shed. Grab that bag of coconut and make it snow on them........gingerbread people. Well that's actually way better. Fantastic! So now just use your icing to stick down the plastic trees and marshmallow woodland creatures near there new home.....that can never ever be opened due to it's complete lack of windows and doors. Add festive red balls around the house to really give it that....."These lights stay up year-round" kind of look. If you have extra cinnamon shards feel free to add a festive wood pile. I don't know how they'll burn it, though. You ate the chimney. You'll note we skipped the pretzel fence. No need to keep out trespassers when you have no point of home entry, am I right? It definitely looks like I made these. I swear I didn't. 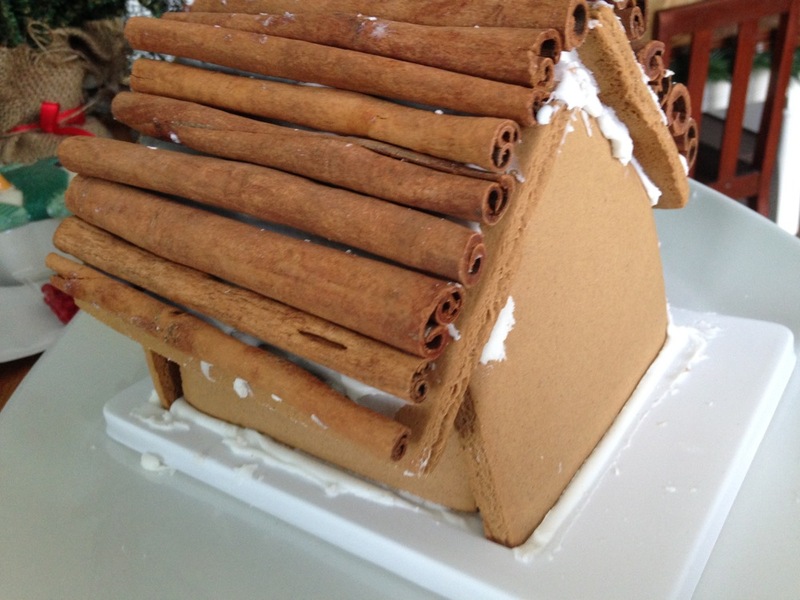 What an epic cinnamon chalet!! Take the ugliest potpourri in the world and place it where people can't really see it up close. If they do you can always blame a child that you know for helping. Or vodka.